In addition to the 1,200-acre property in Madison, Arboretum staff manage eleven properties throughout Wisconsin that are owned by the University of Wisconsin Board of Regents. These outlying properties preserve unique remnant plant communities and provide ecologically diverse refuges for plants and animals. They are also valuable as teaching and research sites and references for restoration projects at the Arboretum and elsewhere. Ten are in the southern third of the state, and one is up north near Minocqua. 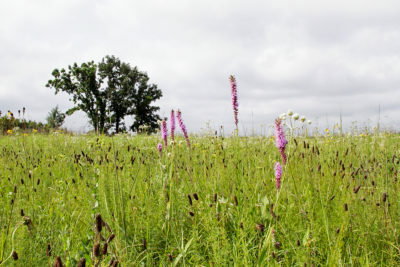 The 90-acre Faville Prairie lies 30 miles northeast of the Arboretum in Jefferson County, just north of Lake Mills. It was originally a small part of the roughly 2,000-acre “Crawfish Prairie” along the western bank of the Crawfish River, the majority of which has been converted to agriculture. The University’s involvement at Faville Prairie dates back to the early 1930s when agricultural economics professor P.E. McCall and wildlife management professor Aldo Leopold created the Faville Grove Wildlife Experimental Area. Working with local farmers, such as Stoughton Faville, and community members, their intention was to demonstrate that crop production and wild game production could coexist and both would benefit farmers. Stoughton Faville also happened to be a skilled botanist, and he would be instrumental to the project’s success. Several other University departments and individuals also contributed over the next decade. Part of the project area included several tracts of high-quality remnant prairie, and Leopold became very interested in their preservation. In 1938 he and others began efforts to persuade the University to acquire a parcel of prairie for protection. It took three years of letters, discussions, and negotiations among landowners, bankers, lawyers, donors, and University officials before their efforts finally succeeded. In 1941, Philip and Eleanor Miles, family friends of Leopold, purchased 58 acres from Stoughton’s nephew, Lynn Faville (unfortunately, a 107-acre parcel of remnant prairie was converted to cattle pasture in 1940 before a deal for its purchase could be made). The deed was transferred to the University in 1945, and the land was named the Stoughton Faville Prairie Preserve in honor of the farmer and botanist. In 1952, the preserve was designated the third State Natural Area in Wisconsin, recognizing it as one of the largest and highest-quality wet prairies still remaining in the state. Around 1958, Stoughton’s grandson, David Tillotson, along with individuals from the Milwaukee Audubon Society, began raising money to purchase an additional 35 acres of adjacent farmland for prairie restoration. In 1976 they donated the land to the University, bringing the preserve to its current 90 acres. The 1945 deed states that the University “shall make reasonable and proper efforts to eliminate or prevent the coming of intrusive or exotic vegetable growth.” And that brings us to the present: the “vegetable growth” they referred to was woody plants, which continue to be a problem decades later. Native species such as gray dogwood, quaking aspen, and various willows have invaded many parts of the prairie, and their shade threatens the sun-loving native prairie plants that make the preserve special. 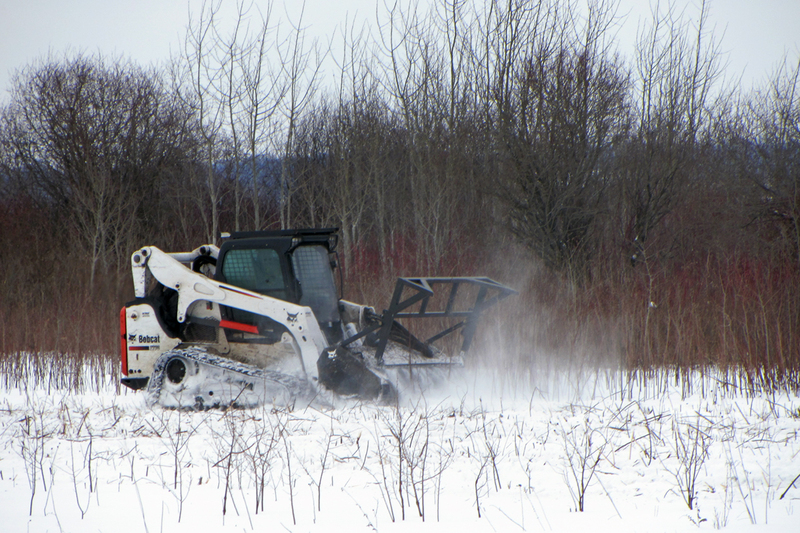 Arboretum crews have cut invasive shrubs at the Faville preserve for many years, albeit on a small scale. We have also had a lot of help in recent years from the Madison Audubon Society. They manage Faville Grove Sanctuary, a larger property of remnant and restored prairies also in the footprint of the Crawfish Prairie, and their crew assists us with annual management of invasive species such as reed canary grass, Canada thistle, and sweet clover, as well as the problematic woody species. In 2016, with support from the Wisconsin Department of Natural Resources (WDNR), Arboretum staff applied for and received a C.D. Besadny Conservation Grant from the Natural Resources Foundation of Wisconsin. With the funds we hired Tallgrass Restoration LLC in March 2018 to mow approximately eight acres of invasive shrubs on and adjacent to the high-quality part of the remnant prairie. The Arboretum crew followed up with multiple rounds of herbicide treatment of the cut stems and resprouts, and the Audubon crew cleared another large section adjacent to the one mowed in March. The project area looked great this summer, but long-term follow-up work will be required. Additional areas still need invasive shrub mowing and, in some cases, large trees removed. We’re working diligently to honor the Miles’ wishes regarding “intrusive and exotic vegetable growth.” Our staff is enthusiastic and skilled, we are planning to upgrade equipment to make our work more effective and efficient, and we have good partnerships with organizations such as Madison Audubon Society and the WDNR. We are grateful for their support and look forward to our continued collaboration in managing Faville Prairie and fulfilling the vision so many thoughtful people set forth so many years ago. Faville Prairie is a research and restoration site with no public trails. For access, please contact Brad Herrick. Much of the historical information for this article was taken from: McCabe, R.A. 1978. “The Stoughton Faville Prairie Preserve: Some Historical Aspects.” Wisconsin Academy of Sciences, Arts, and Letters 66: 25–49.